The Klangfreund LUFS Meter includes a time plot, bar graphs and numeric display of integrated loudness, loudness range, true peak, short-term and momentary loudness measures, as well as a gain fader and target setting window. As you have hopefully read in Sound On Sound over the past few years, loudness normalisation is rapidly becoming the norm. If you are still compressing the life out of your mixes to push the average levels to within a couple dB of full scale, stop right now, or prepare to retire from the audio business! I won’t bore you with detailed descriptions of ITU-R BS.1770-4 or EBU R128 standards, since you can look these up on the Internet, but the quest to make music audio levels more ‘user friendly’ has created the need for new measurement tools. With the new loudness standards, dBFS are out and Loudness Units are in. Of course an LU is a dB, but it’s not a simple peak measurement: loudness measurement requires weighting areas of the frequency spectrum differently, and integration over time, whether that be in the long term — the entire duration of the programme — or over just a few seconds. There are a number of plug-ins available to measure all these metrics, including several already reviewed in the pages of Sound On Sound, but I want to focus on one with some special features that has not previously been covered. I’ve used a BS.1770 compliant meter for a few years, but was looking for a meter that could provide loudness history over time. One such meter is the Klangfreund LUFS Meter, and looking at their site I noticed Mike Senior’s smiling face, with his comment that the LUFS Meter “is a cheap-as-chips loudness meter” and wondered just how cheap chips are in England these days! At any rate, if Mike recommends something, I always take notice, so I read on and saw that the LUFS Meter “provides a unique and fast way to create initial faders-up mixes”. This really got my attention, since I’ve been using a ‘faders up’ approach for years, so I flipped open my PayPal wallet, and in a few minutes I had a licensed copy of the full version. (There is also an even more affordable ‘Discounted’ version with some feature limitations, but this isn’t suited to the faders-up mixing method.) Authorisation is accomplished quickly online, or offline using a token and key file, and worked very quickly for me. The Klangfreund LUFS Meter computes nearly all of the usual metrics (see box), and can plot loudness over time. However, there is no option to display dynamic range (DR), and the manual erroneously states that LRA, Loudness Range, is “the dynamic range of the music”, which is a questionable definition: LRA is really a measure of the variation of short-term loudness over time. In fact, EBU Tech 3342 states “Loudness Range should not be confused with other measures like dynamic range.” Picky, I know, but the two measures describe very different things. For example, music with a dynamic range of 15 LU may have an LRA of only 2.8 LU. LRA is an excellent metric, and not shown in some other meters, so it’s good to have. But it would be nice to have DR shown directly as other meters do. Also, although LUFS Meter can measure true (inter-sample) peaks, and plots loudness over time, the plot does not show when peaks exceeding a target level occur. This is a handy feature I often use with other plotting loudness meters. Balancing out these minor omissions, though, is a feature that makes LUFS Meter much more than just a measurement tool: the user can specify a target loudness setting and engage a button labelled Adjust To, which increases or decreases the level so that the integrated loudness matches your target value. What’s more, you can insert multiple instances of the plug-in on separate tracks and can synchronise them to set target levels, reset calculations, and even adjust the loudness of multiple tracks with the push of a single button. This brings us to ‘faders up’ mixing, a term which appears to mean different things to different people. To me, it means setting up an initial rough mix with all track and bus faders set to unity. By contrast, using the faders to adjust levels in a rough mix typically leaves them at all kinds of settings, from maybe -15 or -20 dB up to +12dB or more. Since faders on most DAWs have finer resolution when near their zero, it makes sense to start with faders set to zero, but to do this you need a way to trim levels without changing the fader settings. Some DAWs have a trim control in the fader panel which can be used to do this, and others have a plug-in to do the same job, but how do you decide what level each track should be trimmed to in the first place? Getting this right is especially difficult with the first few tracks, because you’ve not yet heard the contributions of all the other tracks. One good approach I’ve used is to employ a pink noise reference, as described by Eddie Bazil in his Sound On Sound December 2014 article ‘In The Pink’ (www.soundonsound.com/techniques/mixing-pink-noise-reference). The idea, in a nutshell, is that you adjust the level of each source so that it’s just audible over continuous pink noise, this being a good reference because it matches the energy distribution of music and other real-world sounds better than, say, white noise. In theory, loudness normalisation offers another way to achieve the same goal, by trimming each track to the same loudness value — and LUFS Meter’s synchronisation capabilities make this easy to implement. You begin by inserting an instance of LUFS Meter on each audio track, after any effects plug-ins. Klangfreund recommend turning off ‘true peak’ mode since you don’t need it for track levelling, and it considerably increases CPU load; on my computer each instance used about 0.18 percent CPU resources with true peak metering enabled, and 0.02 percent with it switched off. Next you play back the project so that the LUFS Meters can determine the integrated loudness for each audio track or, to save time, you can use a render operation, which typically runs at 10 to 20 times normal audio rates, especially if you have few or no other plug-ins running. If you then inspect each track’s LUFS Meter, the integrated loudnesses will likely be very different, varying by as much as 25 LU or more. 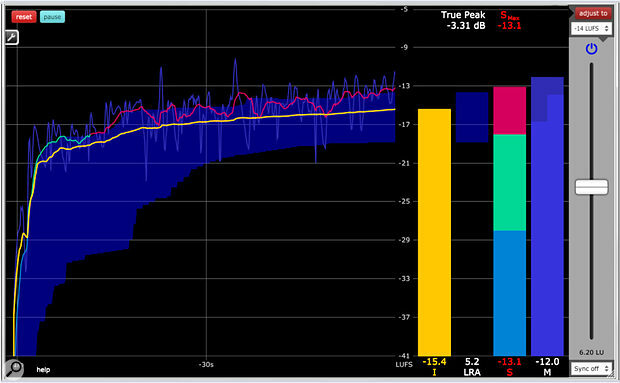 At this point you set a target loudness level: something in the range of -20 to -30 LUFS is usually best, since your busses and/or master bus will be summing many tracks and the resulting level can be higher than on any individual source track. A secondary advantage of using the LUFS Meter plug-in in this way is that if you do find yourself running out of headroom on a bus, you can instantly change the target level for all tracks and readjust them, rather than having to pull down tens of faders which may have automation written to them. 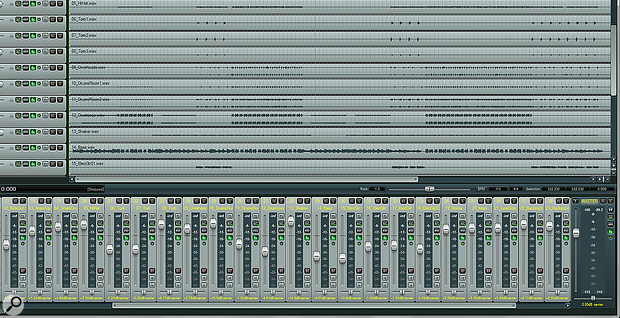 This pair of screen captures illustrates the difference between generating a rough mix balance using the faders (top), and a ‘faders-up’ mix created using LUFS Meter to automatically adjust the level of each track (bottom). 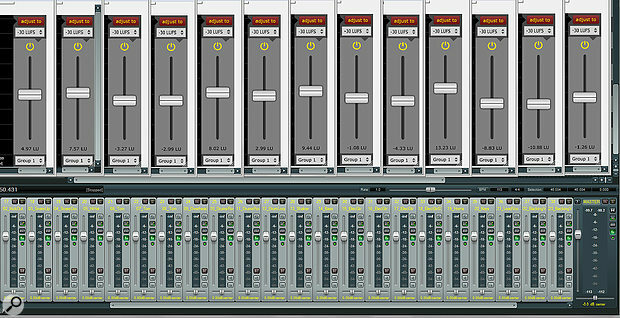 With all faders at unity, the second version makes a much better basis for a fine-tuned finished mix. To test out this procedure, I loaded a new project with 38 tracks using a template in Reaper that includes an LUFS Meter on every audio track, all faders at zero and all pan-pots centred. This took only a few seconds. Next, without even listening to them, I rendered the tracks, and in less than 30 seconds I had every audio track analysed. The integrated loudness varied from -9.8 to -38 LUFS: quite a range! I chose a track target level of -25LUFS, then used the synchronised LUFS Meters to adjust the output of every track to this level. This, again, took only a few more seconds. The LUFS Meter does not actually change the audio on the tracks, of course, but provides gain control over the signals passing through it, increasing or decreasing the levels as needed to make each track play at the target level. It has a gain range of ±60LU, which should cover even the worst tracking sessions! 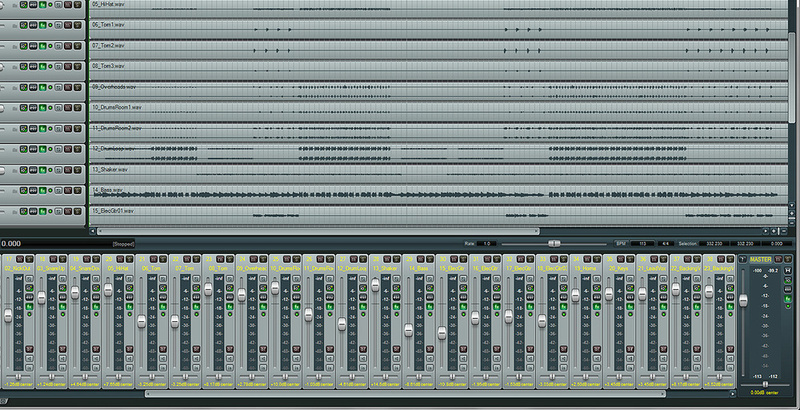 In less than a minute, I had 38 audio tracks roughly level-balanced. Performing the same process using pink noise as a reference would have required me to adjust the trim on each track separately, while listening to its output along with the noise. This has to be done for each track individually, and thus takes much longer, and there is always a bit of uncertainty as to how the track level compares to the pink noise. Using a ‘manual’ 1770-compliant meter without LUFS Meter’s synchronisation options takes about the same time, and in either case, when all the tracks are levelled, if the signals hitting their respective bus turn out too hot or too cold, each track might need to be adjusted again. With the synchronised LUFS Meters, all tracks can be readjusted in seconds at the touch of a button! When I played back the full song, I had a good rough mix balance from start to finish, with one or two exceptions; though audible, the vocals were low in the mix, while snare drums and cymbal crashes were crashing through. Other instruments sounded just about right. One reason for this imbalance is that thanks to the wonders of spill, instruments such as the snare drum are represented on multiple tracks, whereas there is only one lead vocal track. Another is that dynamic sounds such as snares and cymbals, as well as sounds like distorted guitars, naturally tend to get your attention either because they are highly dynamic or because they have strong mid-range spectral content. In other words, matching the integrated loudness across all the tracks did not mean the project was automatically finished! There is still work to be had for a mix engineer, which is a good thing. But only a few minutes’ work produced a very good rough mix, and even better results can be achieved by using several Groups with logically assigned sets of tracks. I went on to finish the project, and in less than an hour had a mix that I’d be happy to share with the band. Compared to the way I worked years ago, bringing up one track at a time, balancing levels as I proceeded, the faders-up approach really works a treat. The old approach often led me on a merry chase as more parts were brought in and the mix got too loud (even clipping at times) and some tracks were masked by added tracks, requiring readjustment of many previous settings, track by track. The Klangfreund LUFS Meter provides an excellent set of loudness measurement tools for mastering, but the unique synchronisation mode, along with its automatic level adjustment, sets it apart from other loudness meters, and truly does streamline the process of getting a rough mix into the ballpark. It’s also very affordable, so surely worth trying out! There are a number of plug-ins that provide measurements compliant with ITU-R BS.1770 and other standards. Some are free and some quite pricey, but I’ve found none that offer LUFS Meter’s synchronised automatic loudness adjustment. One of the best free plug-ins is the Youlean Loudness Meter, which has an even more flexible loudness history plot — it can save a history with your project for viewing later — but it does not have a gain-adjustment feature. Another free plug-in is Melda Productions’ MLoudnessAnalyzer, which does offer gain adjustment, but only on a per-track basis. A pair of very useful non-free plug-ins, reviewed in Sound On Sound April 2015, are NuGen’s MasterCheck and MasterCheck Pro; these do not provide a loudness history plot, but include a ‘send’ module that can be placed on another track or earlier in the MasterCheck track to match loudness of a reference track or match loudness across effects chains. MasterCheck Pro also provides tools to reveal how consumers will hear compressed audio streams on various music platforms. Finally, Meterplugs’ LCAST is aimed at professional broadcasting and provides all the usual metrics and a history plot, at a more affordable price than most professional metering products. It measures Integrated Loudness (ITU-R BS.1770-4), true peaks, Momentary Loudness (EBU R128), Maximum Momentary Loudness (EBU R128 s1), Short Term Loudness (EBU R128), Maximum Short Term Loudness (EBU R128 s1) and Loudness Range (EBU R128), and plots a Loudness history graph. AAX Native and VST plug-in formats are supported on MacOS and Windows, plus Audio Units on OS X, and no iLok is required. The full version supports up to 32 groups and synchronisation across an unlimited number of instances, while the cut-down version offers only one group and six linked instances. Compliant with a wide range of standards. Plots loudness history as well as displaying numerical values. Can automatically adjust loudness of a track to a target value. 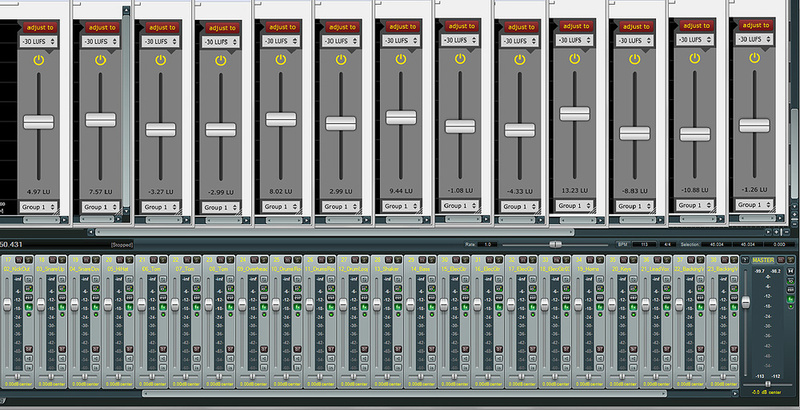 Group mode enables control across many tracks, with up to 32 groups. Can automatically adjust multiple tracks to a target value in group mode. History cannot be scrolled after plotting. Does not plot true peaks exceeding a target level. Does not display dynamic range (though you can calculate it using true peak and integrated LUFS values). LUFS Meter is not only a very capable measurement tool, its synchronisation features also offer a new and blindingly fast way to get a rough mix up and running. LUFS Meter $49; Discounted version $24.